With over 45 years in diagnosing and treating a multitude of skin cancer patients in the sunny state of Arizona, our doctors at Arizona Dermatology are experts in the topic of skin cancer. And right now, one of our top recommendations for treating skin cancer is a procedure called brachytherapy. Brachytherapy is a non-surgical, painless, dermatologic therapy treatment for skin cancer with a cure rate close to 100%. With benefits like these, brachytherapy may be the best treatment option for you. However, before choosing any treatment for skin cancer, we suggest visiting your nearest dermatologist. During your office visit, your dermatologist will cover everything you should know about your brachytherapy treatment, including the important points below. Read on to learn about that facts behind each statement. After, if you feel as though you still have questions about brachytherapy, don’t hesitate to give us a call to set up your consultation appointment. The first, and possibly most crucial, thing you should know about brachytherapy is that it uses radiation. However, the radiation used in brachytherapy is different by being far less invasive than the type of radiation one would receive for the treatment of other various cancers. The radiation used for brachytherapy is generated electronically. Because of this, there’s no risk of radioactivity affecting your body after treatment. With electronic radiation, you’ll experience none of the side effects you might otherwise experience with other forms of radiation therapy or even chemotherapy. The radiation from brachytherapy is also designed with a high degree of precision. The radiation is produced through an x-ray tube, only slightly bigger than a grain of rice, and designed to concentrate the energy within the first few millimeters of tissue. Because of this precision, we minimize or eliminate any risk to deep muscle or other critical organs. In addition to being generated electronically and having a high degree of precision, the radiation from brachytherapy is also extremely gentle. By a way of comparison, the x-rays you may receive at your dentist’s office is almost twice as strong as the radiation generated for a brachytherapy treatment. This gentle impact leaves you with a pain-free treatment. Another important aspect of brachytherapy is the fact it has a much shorter treatment time than other traditional radiation procedures. When coming in to treat your skin cancer with brachytherapy, the treatment itself typically takes five minutes or less to complete. It’s quick, painless, and the results are great with an average success rate between 93-100%. But not only is the treatment itself shorter, but the amount of treatments needed are also minimal when compared to similar procedures. Other methods usually take up to six weeks of treatment and require daily visits. With brachytherapy, treatments are given twice a week for a total of eight visits altogether. When determining if brachytherapy is the best treatment for your particular form of skin cancer, it’s best to turn to one of our specialists for an expert’s opinion. We’ll quickly determine whether you qualify for brachytherapy, as its proven most successful for non-melanoma skin cancers. Non-melanoma skin cancers are grouped together to be easily distinguished from melanoma skin cancers. And unlike melanoma, non-melanoma skin cancers can typically be treated with an appropriate treatment, such as brachytherapy. Basal Cell Carcinoma (BCC) is the world’s most common form of skin cancer. Most frequently developed on the head and neck, BCC is mainly caused by sun exposure and can be identified as abnormal, uncontrolled growths or lesions. To treat this type of skin cancer, we suggest considering brachytherapy. Squamous Cell Carcinoma (SCC) appears as rough, think, scabbed, or elevated areas on your body. As the second most common skin cancer in the United States, SCC is most commonly found in sun-exposed regions such as: the face, lower lip, hands, legs, arms, scalp, and the rim of the ear. If you’re looking to treat this type of skin cancer, without having to undergo surgery, we recommend considering brachytherapy. At Arizona Dermatology, we strive to provide our patients with treatments that’ll give them the most satisfaction. Because of this, our doctors wouldn’t offer any treatment—including brachytherapy—without being certain of the results. A recent study conducted by Group Health showed that brachytherapy is proven to be effective. The study contained 122 patients with 171 lesions that were treated with the quick and painless procedure. At the end of the research period, all of the 171 lesions were resolved and no recurrences were observed. Additionally, within each follow-up treatment, the patients were asked to rate their cosmetic outcome. At the end of the study, 92.9% of the patients shared that their cosmetic outcome of brachytherapy was considered excellent. All treatments for skin cancer carry a risk of side effects—and brachytherapy is no exception. Because every patient responds to brachytherapy differently, it’s important to have accurate expectations of what you may experience after your treatment. In most cases, the benefits of brachytherapy far outweigh the potential side effects of this treatment. 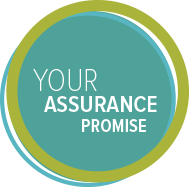 However, if you have any concerns or hesitations about the results of your treatment, don’t hesitate to give us a call. When it comes to treating a serious condition such as skin cancer, you’ll want to ensure that you’re taken care of by an experienced doctor in a professional and compassionate way. At Arizona Dermatology, we guarantee that you won’t find another office in the state of Arizona more experienced, knowledgeable, or invested in your brachytherapy treatment than us. In fact, our office was the first dermatology practice in the Southwest to offer this treatment. And we’re the only practice in Arizona to employ our own full-time radiation oncologist, a nationally known physicist, and a staff specially trained in the delivery of brachytherapy. 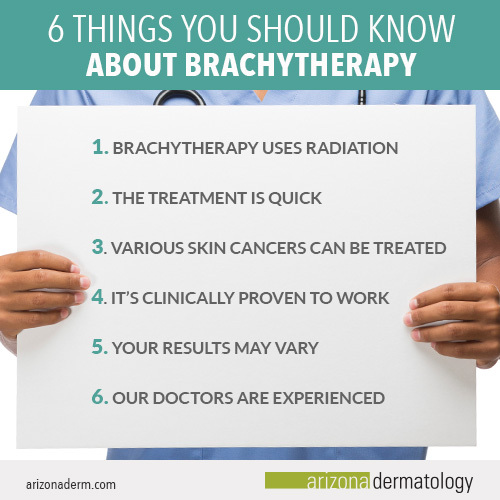 As one of the most experienced brachytherapy skin cancer clinics in the world, you should know that your brachytherapy treatment will be handled gently, quickly, and effectively at Arizona Dermatology. If you have any questions, concerns, comments, or are looking to learn more about brachytherapy, give us a call. Our doctors are here to help you through your skin cancer journey to ensure you get the results you deserve.